. "Mountain Ash". The Canadian Encyclopedia, 04 March 2015, Historica Canada. https://www.thecanadianencyclopedia.ca/en/article/mountain-ash. Accessed 20 April 2019. Mountain Ash (Sorbus) are a genus of small trees or shrubs of the rose family (Rosaceae), consisting of perhaps 100 species distributed in temperate Eurasia and North America. Sorbus decora is native to Canada. Its small applelike red berries are much sought by birds (artwork by Claire Tremblay). Mountain Ash (Sorbus) are a genus of small trees or shrubs of the rose family (Rosaceae), consisting of perhaps 100 species distributed in temperate Eurasia and North America. 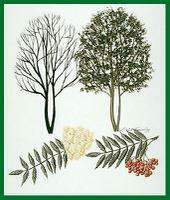 Plants are deciduous, lack thorns, and have simple or pinnate (feather-like) leaves with 9-11 leaflets. Creamy white flowers form large, flat-topped clusters. Small, red, applelike fruits are much sought after by birds. There are 4 species native to Canada, usually found in moist woods: 2 eastern (S. americana, S. decora) and 2 western (S. scopulina, S. sitchensis). The introduced European mountain ash or rowan (S. aucuparia) is grown as an ornamental from Haida Gwaii to Newfoundland and Labrador, and often escapes, appearing native. In some reference works, Sorbus is included in the genus Pyrus (pear). Berries and bark were used as medicine by North American First Nations. The wood is easily bent and was used for canoe frames and snowshoes. Mountain ash is not a true ash.